Beautiful weather = I want to get my patio set up, cleaned off, ready to enjoy. One of my favorite patio accessories are these string bulb lights (only $13/strand) – comparable lights from Pottery Barn and Crate and Barrel are $40/strand. I may be a little early to the game but swimsuits are already out all over the place so I bought this little mesh number – my first one piece in about 20 years. It holds everything in and smooths everything out without screaming “mom alert!” so I’m ok with it. This striped shirt is seriously the softest thing you will ever feel. It was my first purchase from Madewell but definitely not my last. Only $20, a total steal for a shirt you will literally want to sleep in. It’s lightweight so definitely enough time left before summer to get lots of wear out of it. If you’re looking for Easter basket ideas, these bunny flats are just the cutest thing in the world. Plus Gap is in Friends & Family right now so your entire purchase is 40% off. This striped swing dress (are you noticing a pattern?!) 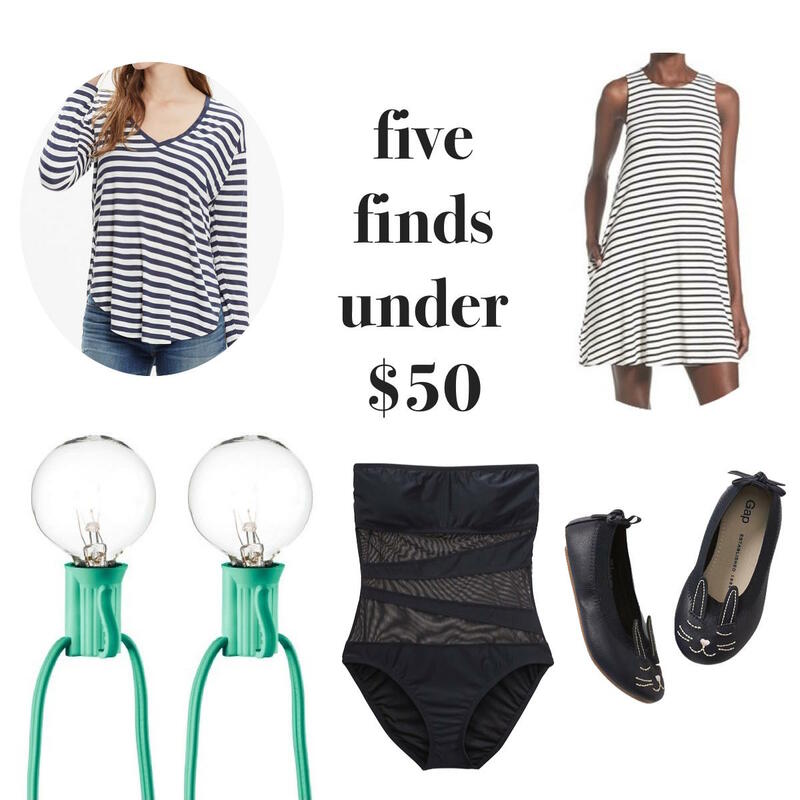 is under $35, so comfy and super versatile for summer. It’s swingy and has pockets with a high enough neckline to keep things work and park appropriate. I’ll be wearing mine with a jean jacket and Converse sneaks. Any awesome finds this week? Tell me in the comments!